It is becoming increasingly clear sustainable public policies are essential if we are to achieve a sustainable future. Democratic institutions have painstakingly created laws, rules, regulations and policies that enabled the old economy. While society has realized considerable progress from this first generation system, old policy structures are not fit-for-purpose any more. What’s needed is a holistic reboot of public policy to assure a sustainable future for companies and society. The only way for governments to succeed at this task is with the support and involvement of industry allies. What’s not clear is whether the companies and the trade associations that represent them are up to the task. But there is some hope. Take Interface, a leading manufacturer of modular carpets. The company recently waded into unexplored policy territory when faced with California’s proposed mandatory carpet recycling law: last fall the state raised the recycling bar, requiring manufacturers to recycle 24 percent of carpets by 2020. The Carpet and Rug Institute, the association which represents the carpet industry, vigorously fought the legislation. However, Interface was in favour of public policies that help the sustainability leader achieve its objective to create a closed loop system for its carpets. As a result, the company broke with its industry colleagues, resigned from the association, hired a lobbyist and worked with NGOs to support the legislation’s passage. Encouragingly, customers supported Interface’s stand. According to Interface’s VP of Strategic Alliances – and as reported in an industry journal – most architects and designers are on the progressive side of product stewardship and fully behind the company’s efforts to create a circular economy. On the other side of the ledger, investors have dipped in to sustainable public policy waters. This past spring, for example, a group of investors with around $1.1 trillion in assets under management, called on Ford and General Motors to urge the Alliance of Automobile Manufacturers to end its climate-science questioning lobbying and uphold energy efficiency standards. The investors called out these venerable automakers for allowing their trade association to condone a position at odds with the manufacturers’ public positioning on climate change, putting their reputation at risk. That investors are on to this shadowy practice is evidenced by the 2018 proxy season where lobbying and political spending were among the top sustainability issues on which investors agitated. Public affairs and government relations departments contemplating this new reality can feel overwhelmed. Fortunately, there are emerging best practices which companies and their government and industry relations teams can follow. 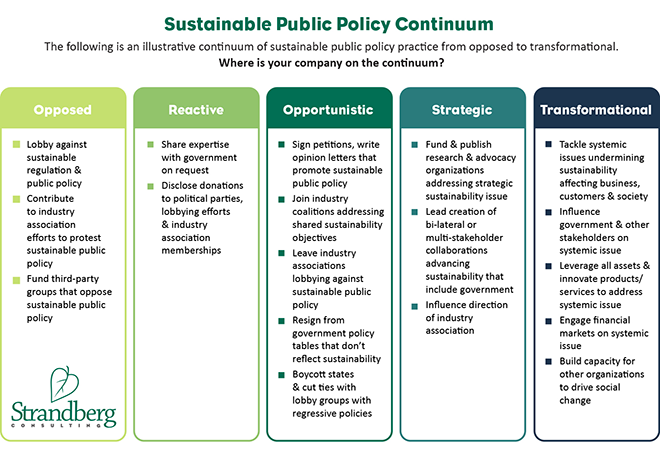 As set out in the maturity continuum below, companies are beginning to distinguish themselves by where they stand on sustainable public policy. Expect that in the future more advanced strategic and transformational companies will be influencing the direction of their industry associations and engaging their peers – even competitors – on sustainable public policy action. Recently, the Conference Board of Canada entered the debate. 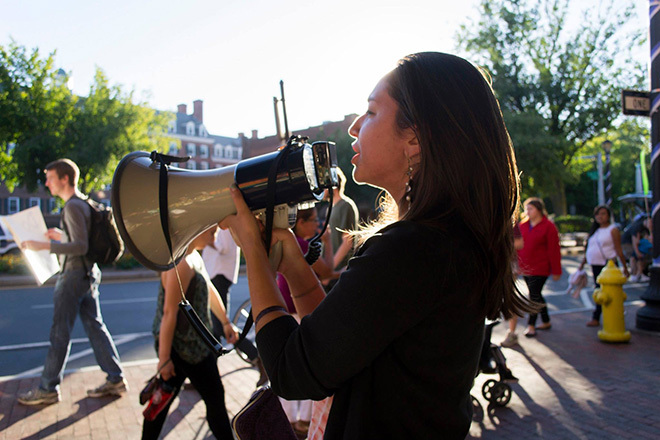 Its “Advocacy for Good: Public Policy Advocacy for a Sustainable Future” provides a roadmap for courageous companies to become champions of sustainable public policy. Additionally, Canadian Business for Social Responsibility (CBSR) offers this guide to companies on sustainable public policy, one of the qualities of a Transformational Company. Public affairs and government relations departments should take a look. Industry associations equally need to get up to speed on this emerging government pivot. They put their organizations at risk if they fail to engage their sustainabilty leaders and understand the changing investor landscape. Here is a tool for trade groups to get ahead of these issues. If you know of or belong to an industry association, urge them to check out this article and tools. Leading companies and trade associations proactively engage with governments and policy-makers to achieve their sustainability goals and build a strong foundation for societal well-being and industry health. Government policy needs a sustainability reboot: it’s up to companies and their industry associations to kick it into high gear. Browse blog posts by category below, or return to the main blog page to search or browse by keyword.